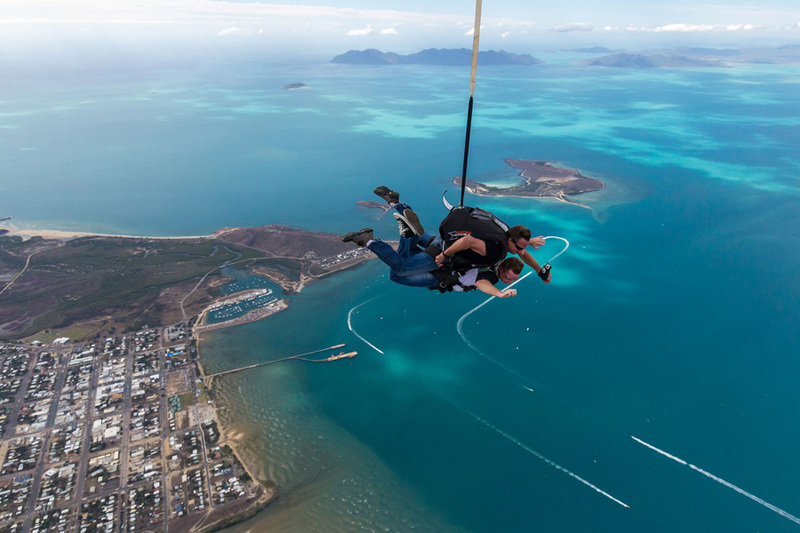 Skydive over the Whitsunday Islands for a once-in-a-lifetime experience! Choose from 10,000ft or 14,000ft and experience the rush and thrill of skydiving! Skydive Whitsundays is one of the best ways to experience the Whitsundays! Soar to new heights and explore something new and exciting during your time in the stunning Whitsundays. Your skydive will take place in Bowen (1hr drive from Airlie Beach), and you can choose from two different dive heights, or opt to go for a beach landing- the only one of its kind in the Whitsundays! This extreme sport puts safety first, with fun coming in a close second, for the ultimate thrill. Choose from a 7am or 11am departure and enjoy a half day of adrenaline, action and once-in-a-lifetime moments! This tours includes a 5 Star skydive departure lounge in Airlie Beach, with free coffee and water, where you can enjoy some downtime before the big jump! Our team of qualified instructors are all APF accredited and highly experienced, meaning youwill have a fun and safe journey to new heights. Our modern sports skydiving equipment is maintained and serviced to strict standards to ensure only the best experience for each and every tandem diver that comes through. Also on offer are photo and video add ons so you can keep living your dive over and over for years to come! Choose to just add photos or video, or add both for the ultimate add-on to your dive. Long after your skydive is over, you can keep showing your family and friends how amazing it is to free-fall from new heights! 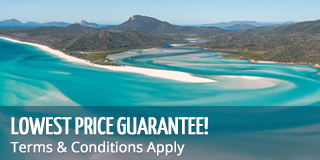 We offer the opportunity to experience a beach landing in the Whitsundays. Just like a cherry on top, this is the perfect way to end an already amazing experience. Glide down and feel the sand beneath your feet to finish off the day right. Please note minimum age for a tandem diver is 12 years old with parental consent or 18 years old for solo divers. All divers must provide their weight at time of booking. Skydives are conducted in Bowen, approx. 1hr drive north of Airlie Beach. BOOK WITH US TODAY! CALL 1800 550 751 OR LIVE CHAT US NOW! Add to your Whitsundays experience... Combine multiple tours to unlock exclusive discounts! All departures and itineraries are subject to weather and may be changed or cancelled at the discretion of the operator. With all customers we reserve the right to refuse a skydive based on our assessment based on age, weight and health to ensure everyoneÃ¢â‚¬â„¢s safety. It should be noted that adventure travel involves risk. Whilst we make every effort to safeguard clients, we cannot be responsible for personal injury or loss due to actions of our clients which are beyond our control. We recommend that you have travel insurance. All cancellations forfeit all deposits. There is a 2.5% surcharge for credit card purchases. Skydiving involves inherent risks and Mr-Travel/Sailing-Whitsundays cannot be held responsible for the actions of the operator or clients. All client cancellations forfeit 25% of total ticket price and all client cancellations made less than 21 days prior to departure will result in complete forfeiture of the full price of the tour or package. If the tour operator has to cancel the trip or activity (prior to the departure) and we cannot offer a suitable alternative, then a refund will be given minus card fees. We strongly recommend that you have travel insurance, especially during the wet season. "Had a great time with the Airlie beach skydivers and would go again. Would have been nice to increase the free fall time a little more. Was told I'd get 50-60 seconds and only got 30. The video work from Paddy was pretty awesome and I felt safe the entire time, a little too safe. All I all a great experience and I would definitely jump again." "Very good experience for my first jump! Didnt expect it to be so far from Airlie Beach(1hr drive) but the view was great and the staff was helpful and professional! Unfortunately the weather wasnts great, but still enjoyed every second! Thanks to Zac in particular, that made me feel very safe during the tandem!" Click here to receive specials and discount vouchers for all of your East Coast adventures! Please select a Date of Travel above to view product options. This booking portal is not live. Please ensure that you have checked availability before submitting payment, as a pre-authorisation will be required. Reservations are not confirmed until verified by a travel staff member. Ask our friendly sales crew on the Chat window for more information. I have read, understood and agreed to these terms and conditions.